Congrats to Force India Team for winning this Event and reaching TOP position at the overall Team classification. Many thanks for the 3 track creators : DJ-BIG-L, JojjeOkocha and Most-C-wanted for the high quality of tracks used during this Event. And finaly thanks to evryone for having join this event. I hope you enjoyed it even if we started late due to the number of people here. Good job with the event DJ and Frinke, and congrats to all who did well in the cup. I had a lot of fun. 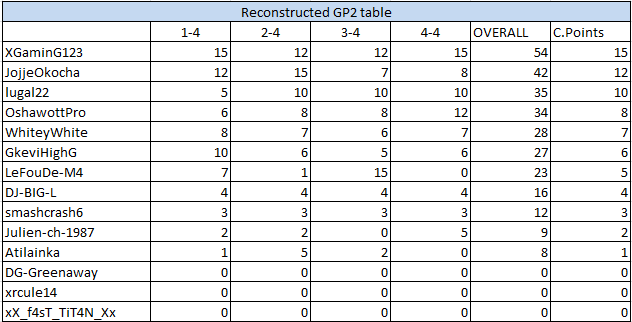 There was actually not a lot of incidents in GP2, which was great. Very clean racing overall! Let me know if there will be another compacts cup later, and I can help with picking the races. 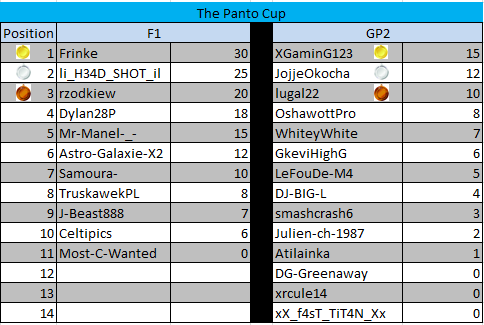 Yes Jojje, there will be a Panto CUP 2 but not for now, I think in the coming months. You impressed me Jojje, you've managed very well in this CUP, congrat !!! Bon évent, merci DJ (et Frinke le traducteur lol) pour l'organisation.